Rick's unique talent is "Strolling Accordion". Having performed at many weddings, corporate parties, fundraisers, and private functions, the audience is always amazed at the great atmosphere created with his live renditions and repertoire. Continental (especially Italian, French, and Polish music), 50's thru 70's (and some later) hits, blues and jazz standards are personal favourites of his wide musical range. Performance credits include years of performance with The Hansen Singing Strings, the Zigge-Zagge's, and the Oktoberfestenheimers (strolling at dinners and Oktoberfest shows), television appearances, studio/session work, senior's centres, trade fairs, press/promotional tours, countless wedding receptions, guest adjudicator at music festivals, bandleader, and many official KW Oktoberfest events in Kitchener-Waterloo (including opening and closing ceremonies, Miss Oktoberfest Pageant Ball, and Festhalls). 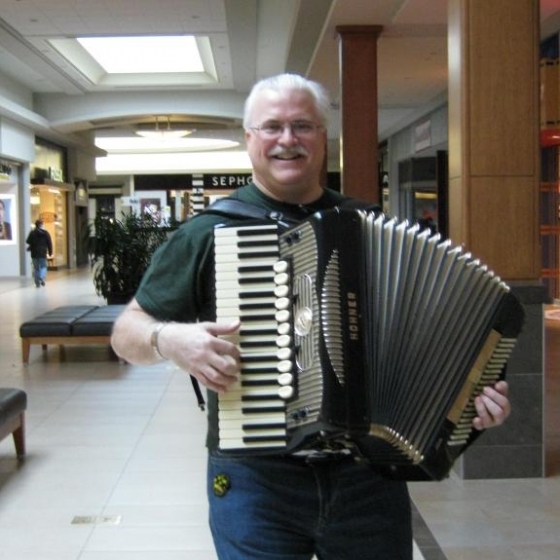 If you or your band are looking for a unique addition to your ensemble or if you are looking for a Strolling Accordionist with a joy to entertain, give Rick a call. Hire Kitchener's Best-Kept secret for your next event! See some samples of me in action – ENJOY!